The tech press pretty much like the hardware design and think that it is design for people who are already live in the Google ecosystem. People are aware of is the price of the device. Starting at $1,299 is not exactly cheap. An agreement among my friends are why should one buys a device that only runs a browser when you can buy a computer that can run any browsers plus other things. It is not easy to argue with that. 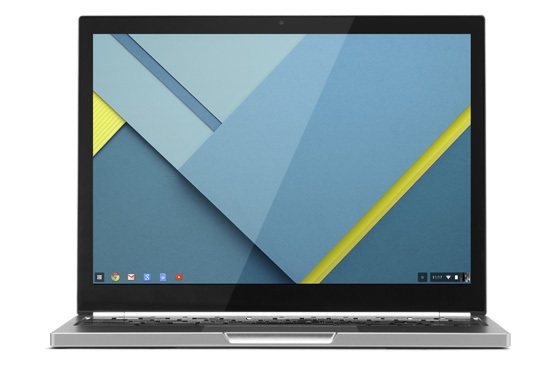 However, I want to appreciate the bold move that the Google Chrome OS team take, which I feel it is similar with the Tesla’s direction. Their similarity is to build the best. Tesla did not build an all electric vehicle that is powerful enough to bring you from home to work. Tesla build a race vehicle that is powerful enough to compete with BMW. Google Chrome OS team did the same. They build a computer that many press actually compare them with the high end laptops. A laptop that is powerful, a laptop that has the highest resolution, and a laptop that actually has a touch screen. This attitude makes Tesla stand out from other motor companies and it certainly makes the Chrome OS stands out from the rest. This entry was posted in General on February 27, 2013 by Kennith. I just finished watching all 13 episodes of House of Cards. I am not going to discuss about this show, which is good and I recommend it, but I want to discuss about the availability of this show. House of Cards is the original TV series financed by Netflix. Netflix is a movie rental company that provide customers both DVD and streaming online. Usually a TV series will show each episodes once a week. Netflix did it differently, it puts all 13 episodes available for viewing. As a Netflix subscriber, you can choose to watch it all at once, once a week, or once a day, at your own pace. This model is what this generation want. Watch it anytime and anywhere. I wish there will be more shows available on Netflix this way. I just like it better. This entry was posted in General on February 23, 2013 by Kennith. This page is broken when I translate from Blogger to WordPress. This entry was posted in General on February 21, 2013 by Kennith. Project management, it is an art. It is a skill that requires understanding the resources you have and the goal you are trying to reach. It is easier to plan a project if the resource and goal do not change from the start to the finish of the project. The world does not work like it should. How do you manage when the variable of resources and goal change in the middle of the project even when you plan well? There was a pretty good discussion on Hacker News today. It is still rank #2 by the time I checked again in the afternoon. I thought I would share some experience using Vim. Vim is installed on most Linux machines. There is no need to install when you have SSH access to the Linux machines. At first, I use Vim mostly to quickly view the log file to diagnose problem or performance. I did not bother to do much with it. I would just do Samba and make my home directory read/write-able though my Windows machine and edit the files using various IDE. I was happy with my UltraEdit and Textpad. Vim was still difficult to use to me at that time when I was still struggling writing good code. Then one day when the commercial IDEs start asking me to upgrade their products and I thought why should I? I did not like it. This is when I start really forcing myself to learn Vim. View mode and write mode was pretty hard on me at the beginning. I had to print out a cheat sheet for me to remember all those keys’ feature. After a while I finally got used to Vim and it opens up another world to me. At first, I would open-up multiple SSH tunnels to edit multiple files. I would open up 5 tunnels to edit 4 files plus another tunnels to run terminal programs. Until… I found Ctrl+z and fg. It becomes 1 tunnels run multiple tasks.. I worked on multiple Linux machines all the time and yes, storing the setting on Github was definitely a time saver. I used to copy the .vimrc, syntax, indent among machines. Since I Github my Vim setting, when I arrive at a new Linux machine, if allow, I simply do a git clone, then the strange new Linux machine become just a home. Yes, learning Vim requires time and discipline. Once you pass that learning curve, you will definitely love it. This entry was posted in General on February 20, 2013 by Kennith. I bought a bottle of orange juice. It was $4.99. I also bought a bottle of herbal drink, it was $2.99. These two bottles were seal under the cap. That means I have to unscrew the cap and peel off the seal for the first cup. It gave me a sense of protection that these drinks were not touched by anyone else before. However, the seals were different in design. The orange juice’s seal had a little extra plastic seal that I could lift it up and pull the seal off the bottle with ease. The herbal drink’s seal was sealed around the bottle. First I have to touch around the seal to find a “weakest” point to peal off the seal. The seal would break somehow when I was taking the seal off. Therefore, I had to peal off the seal two steps. I thought I could not possibly be the only one had this problem. Does the manufacture’s owner had this problem? Would it cost an extra 50 cents for the herbal drink manufacturer to replace the cap that the orange juice used to seal the bottle? It will probably hurt the sales for the 50 cents increase. As a consumer, I surely will try to find a bargain on everything I buy. However, this caused me thinking about one thing. If the manufacturer does not care about the detail about their product (the seal), what other things they do not care about? They can overuse the filter in order to save some cost? The lesson I learned is if I am to build a product, every detail must pay extra attention. A great product with great details give customer confident. It should not be a race to bottom price, but a race to better product. This entry was posted in General on February 19, 2013 by Kennith. Writing Blog For 30 Days. I stopped writing blog since I spent more time with Twitter, Facebook, and Google+. As a result, most of my “writing” tends to be short and without spending much thought over it. My writing becomes just a burst of emotion. I didn’t bother to review what I wrote and I pressed on “Send” as fast as I could. This has become a problem. My pathology of thought became shorten and unclear. I practiced less on critical thinking. Photo has become an album instead of a compliment of text. Starting today, I will start writing blog again. One entry a day for 30 days. There will be no restriction on topics. I will just write. This entry was posted in General on February 15, 2013 by Kennith.